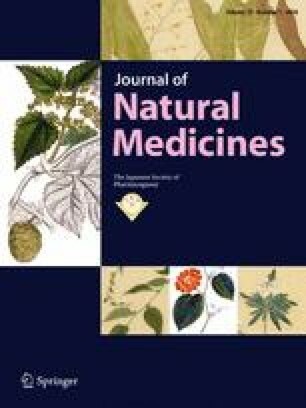 Phytochemical investigation of the methanol extract of Vitex limonifolia leaves led to the isolation of three new labdane-type diterpenoids, vitexlimolides A–C (1–3) and eight known compounds, 5,4′-dihydroxy-3,7-dimethoxyflavone (4), vitecetin (5), 5,4′-dihydroxy-7,3′-dimethoxyflavone (6), verrucosin (7), 2α, 3α-dihydroxy-urs-12-en-28-oic acid (8), euscaphlic acid (9), 18,19-seco, 2α, 3α-dihydroxy-19-oxo-urs-11,13(18)-dien-28-oic acid (10), and maslinic acid (11). Their chemical structures were elucidated by physical and chemical methods. All compounds were evaluated for antiviral activities against CVB3, HRV1B, and EV71 viruses. As a result, compounds 4 and 6 showed potent antiviral activity against CVB3 infection with IC50 values of 0.12 ± 0.06 and 1.86 ± 0.18 (µM), respectively. The online version of this article (doi: 10.1007/s11418-017-1125-2) contains supplementary material, which is available to authorized users. This research is funded by the Vietnam National Foundation for Science and Technology Development (NAFOSTED) under Grant Number 104.01-2014.02 and the Basic Science Research Program through the National Research Foundation of Korea (NRF) funded by the Ministry of Education, Science and Technology (NRF-2011-0025129).